Four weeks after the last Lunch Club meeting, we reconvene for our first Indian food outing. I would have never thought about going to Jashan, since at first glance the sign downstairs doesn't look that impressive. But our fake Indian member insisted that they serve good food. And the place did garner a Bib Gourmand rating from the people at Michelin...although I have to say that a couple of places on that list looked dubious. Murgh tikka - HELLO?! Any bozo can order this dish on their own including me. But all kidding aside, it's classic because it is just so good. Tender chicken marinated in spices and yogurt, then stuck in a tandoori oven and served on a hot plate. Yum! Goan fish curry - this was one of the winners. I normally don't have fish curries at Indian restaurants, but I must admit that this was pretty good. Maybe it is because the sweetness on the palate. Dhansak - another pleasant discovery, this is chicken cooked in lentils and pumpkin. The texture is pretty interesting, and one of the few times I actually liked something cooked with lentils. Palak paneer - the typical cottage cheese cooked in spinach. I love the way spinach is cooked in Indian cuisine into a soft paste. I have to say that the food was pretty decent. It's been a while since I've had Indian, and I'm happy to have found another restaurant I can go to. By the way Mr. Fake Indian, you're sooooo fired from Lunch Club... Just kidding. This was the last night that my friend would be in town, and I promised to take him to a Hong Kong institution - Sheung Hing Chiu Chow Restaurant (尚興潮州飯店). It's a well-known, local place (read: no decor nor service) which serves up simple and homey Chiuchow fare, together with some expensive seafood items. We sat down on the ground floor at one of the three locations which are next to each other (No. 37), in full view of the chopping station. A couple of geese and a bunch of large crabs hung on the racks in front of the window, awaiting clients' orders. We started with a cold crab (凍蟹) - one of the signatures of this place. We didn't get one of the big ones hanging in the window, since it wouldn't have made sense for the two of us. The captain was kind enough to persuade the guys at the chopping station to produce a smaller crab for us at half the price. A very straight forward dish - fresh seafood served cold so the texture and the sweetness of the flesh is just perfect. I didn't need to use the dipping sauce. You can't come to a Chiuchow place without having some marinated mixed platter (鹵水拼盤). The goose was so-so today, with some pieces being a bit tough. The tofu was not bad - the skin was nice as it had been deep-fried before - but it was too salty from soaking up the soy sauce on the plate. The big bowl of prawns with dishrag gourd (水瓜煮蝦) was very delicious. I never realized that there was a variant of my favorite ridged gourd (絲瓜), which is just as yummy. It's cooked in soup with minced pork and glass vermicelli along with some large prawns. The overall taste if very nice, and the addition of minced pork with the seafood seems like the classic Chiuchow touch. Despite being pretty full by this point, I decided to have some crispy pan-fried noodles (糖醋麵). The portion was HUGE. I guess since they want to charge HKD 50 and there's nothing but plain noodles (they throw in the vinegar and sugar for free), they need to make sure there's enough of it.... The noodle comes out in a giant "cake" and one side is crispy. Sprinkle some sugar and with a few drops of vinegar, you've got a pretty yummy product. I packed most of the noodles into a doggie bag so it won't go to waste. Just when we thought we could fit nothing more into our stomachs, the waitress brought us bowls of mung bean soup (綠豆爽) as we were paying the bill. The husks have been removed so only the centers were used. Pretty decent. Last night a small group of Hong Kong's foodies gathered at Caprice for dinner. Those in attendance included a famous blogger (no, I'm not talking about myself), a prominent journalist, and publishers of a popular dining guide. I was honored to have been included as part of this select crew. The theme of the dinner was...cheese! Anyone who has been to Caprice would probably have been introduced to their amazing cheese selection, many of which have been sourced from the famous affineur Bernard Antony. Nowadays the restaurant has a cheese room where Jeremy the maître d' stores his precious babies. We met in the lounge of the restaurant, and started with a bottle of NV De Sousa Cuvée des Caudalies. This blanc de blancs was made from grand cru grapes from vines which are more than 50 years old, and disgorged in February 2005. Wonderful nose of caramel, toffee, vanilla and minerals. Very smooth and a bit sweet on the palate, with pretty low acidity. It's pretty amazing to find a non vintage Champagne which drinks like it's been aged for years, as the caramel and toffee nose would seem to indicate. I am reminded of the Champagnes from Jacques Selosse. We also nibble on some cheesy puff pastry, as well as a plate of jamon iberico. What a nice way to start dinner... After chatting for a while, we finally moved to the chef's table behind the kitchen, where we had direct access to the aforementioned cheese room. We started with an amuse bouche of tuna - raw and seared tuna with some black olive dressing. The flavors from the herbs on top worked to balance things out. Galet de Bigorre - from the département of Hautes-Pyrénées, this was a very creamy and smooth goat cheese, with nutty flavors and a slightly bitter aftertaste. Chaource - from the département of Aube southeast of Paris, this was first salty then a little acidic on the palate. Very nutty. The flavors were really enhanced by the Champagne, as the acidity and the carbonation neutralized the salty taste. Colombier Fermier - this Burgundian cheese starts with a touch of salt, followed by a little acidity and then, amazingly, a sweet aftertaste in the mouth. Tomme de Brebis Corse Bio - this organic cheese from Corsica had a distinctive smoky nose, and the flavors were a bit mild and slightly acidic. Thi was also paired with some fig jam. We took a break from the cheese, and had some delicious leg of lamb. The Pyrénées lamb was fed on freshly sprouted leaves of grass. 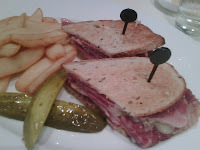 The meat was pink and tender, and just fatty enough to have that distinctive flavor. The exterior has been rubbed with some rosemary for the classic combination. We also had some salad and a delicious helping of orzo, cooked Provençale-style with black olives, zucchini and red peppers. We had a bottle of 2004 Jamet Côte-Rôtie to go with the lamb. Lovely nose of pine forest, mint and a little smoky and floral. After additional aeration we got oriental spices, cloves and patchouli. Beautiful wine. Unfortunately, I'm pretty stuffed at this point...as was most of the party. I wasn't able to finish the lamb, as I wanted to save room for some more cheese. Time for the second platter, which again consisted of 4 different types of cheese individually paired with wines. The flavors of these would be much stronger than the first four. Mimolette extra vieille - from memory this is aged for 18 months. I have always liked this cheese, but today I would experience a revelation. Jeremy paired it with the flagshp white beer from Hoegaarden. This was an amazing combination, as the strong, salty taste of the cheese was completely neutralized by the cold, sweet taste of the beer. Everyone at the table was impressed with this pairing. Comté - my favorite cheese at Caprice. This has been aged for 4 years, and Jeremy tells us that he's got the last two wheels produced in 2004 by his supplier. He is looking to age some for an additional year and see what it would taste like. We watched him use a steel wire contraption to cut a slice from the wheel, and I realized that what's he's holding in his hands is actually a garotte that is capable of decapitating someone...but enough about that. Love the intense flavor and the crystalline salt here. Roquefort Le Vieux Berger - very strong blue cheese from sheep's milk made by one of the few producer who isn't part of the Société. I only nibbled a little bit as I'm almost bursting by now. This was an awesome dinner. We were able to sample the best selection of cheese from Caprice, and given the quality of their goods that is saying a lot! Now that I know it's possible to plan a dinner entirely revolving around fine cheeses (and wines of course!) I look forward to returning for another round... perhaps in a different season in order to get some different varieties. Tonight we had a cozy gathering of ex-colleagues, only one of whom is still working for the same employer. We had been talking about going to the Yung Kee VIP Floor (蘭亭閣, on the fourth floor) for some time, and we finally got around to it. One always starts a meal at Yung Kee with some century eggs (糖心皮蛋). These things may look gross to some people, especially those who aren't Chinese, but it's kinda like manna from heaven for those who have acquired the taste. Right off the bat we were served the dish that we came for: fatty char siu (肥窿叉燒). This was pretty awesome stuff. The pork had lots of fat, both on the edges as well as in the middle, like five layered pork (五花肉) but without the top layer of skin. The roasting process caramelized the fat, which makes it very, very delicious. 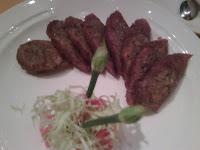 The taste is similar to that of roast pork jerky (豬肉乾) that one finds in Taiwan or Singapore. This was a good start. Next came the most expensive dish of the meal - freshwater shrimp stir-fried with crab roe (禮云河蝦). The shrimps were tender and bouncy, while the crab roe was creamy and delicious. I had pre-ordered the double-boiled roast duck soup with Chinese parsley and preserved orange rind (香茜陳皮燉鴨湯), and they decided to give us half a duck since there were only four of us. I guess they have no idea of the voracious appetite of this group... Anyway I still love the soup. It's a bowl full of the parsley and orange rind, but the flavor of the roast duck is already in the soup. We did end up having most of the duck meat that was served separately on a plate. The steamed egg with conpoy (瑤柱水蒸蛋) is a real homey dish, although as someone remarked, you probably wouldn't add any soy sauce when you do this at home. Another plate of stir-fried pea shoots (清炒豆苗) as it's still the veggie of the season. Finally we have the stir-fried glutinous rice with winter meats (生炒臘味糯米飯). Now this is a place that knows how to get this right! The rice is relatively dry and chewy, and the grains stick together and don't fall apart when you pick them up with your chopsticks. The last few times I had this rice elsewhere have been a little disappointing, and I'm glad that Yung Kee still knows how to get it right. For dessert I did not get my own bowl of red bean soup or black sesame soup, but I did have a few pieces of white sponge cake (白糖糕) as well as red bean cake with osmanthus (桂花紅豆糕). I brought a bottle of 1988 Hugel Riesling Vendage Tardive to go with the food. Being a late-harvest wine, naturally it is a little on the sweet side. Classic nose of petrol, flint, acetone, marmalade and muscat grapes. Due to the age of the wine, there were lots of tartaric acid crystals that have formed as sediment at the bottom of the bottle. I had actually never seen so much crystal in one bottle, actually, and visually it's a bit weird to see them in your glass. Today is the 15th day of the Lunar New Year, and Chinese people traditionally celebrate the Lantern Festival. It's a time for family gatherings, but since my family doesn't live in Hong Kong, I was invited by my colleague to celebrate with some of his family and close friends. My colleague tends to go to Farm House (農圃) for family gatherings. This place had pissed me off last year with poor service and subpar food, so it was a good opportunity to see whether things would be better this time around. A magnum of the 2002 Château de Malleret was decanted and served during dinner. This wine actually drank quite well given that it's a Cru Bourgeois Supérieur. Stir-fried beef with ginger and scallions (薑蔥爆牛肉) is a simple dish, yet one that always hits the spot since it's basically comfort food for me. 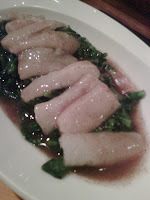 Eastern star garoupa with radish and tofu skin (蘿蔔腐竹燴東星斑) was interesting as it isn't the normal Cantonese steamed fish. The fish was pan-fried first, so the skin has a lot more taste. I didn't get to taste the steamed egg (蒸水蛋), but the soy chicken (豉油雞) was excellent. The chicken came in a claypot and was dunked in a pool of sweet soy sauce. Pretty yummy. The choy sum (菜心) was good, and the claypot rice with preserved meats (油鴨臘味煲仔飯) was a nice way to finish. Following Chinese tradition, we had stuffed glutinous rice balls (湯圓) for dessert on this night - with a ginger soup base (薑汁) in the Canto version. I'm glad I am still able to maintain part of my heritage, although being part Shanghainese means I'm more used to having these in fermented rice (酒釀) soup. Changunnie turned two today. I had been planning to introduce her parents to my favorite pig at the Kimberley Restaurant (君怡閣) for some time, and when the dinner was set for Changunnie's birthday, the whole family (including grandparents) came out to celebrate. We started with a few small dishes to kick off the meal. The braised beef shank with five spice (五香牛腱) was done pretty nicely, and it's a dish I should learn from mom so that I could make it at home. The pig trotters (鹵水豬腳) were also pretty yummy, and there were only little bits of bone attached. Finally there was the deep-fried salmon skin, which we put in front of the birthday girl and told her it was a cracker. It was light and not too oily, and she absolutely loved it. The waiter brought in a giant claypot which contained the clear ox bone soup (清燉牛骨湯). This was done with radish and sprinkled with lots of spring onions. The Korean contingent at the table - which was in the majority - got pretty excited since this was similar to the way beef soup is done in Korea. The broth was pretty rich from the extended cooking, and very sweet thank to the radish. The spring onions provided a nice pickup of flavors. The meat was very, very tender as were the tendons around the bones. There were smiling faces all around, and many of us had seconds. The pan-fried tiger prawns in soy sauce (頭抽煎老虎蝦) was as good as I had expected. The restaurant had some tiger prawns and suggested that we use these instead of the regular prawns. Lots of flavor here, and I eagerly licked the shells clean and sucked the head dry. What a wonderful dish. 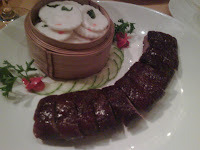 Of course the real reason we are here is the roast suckling pig stuffed with glutinous rice (金陵全豬烤金苗). It's my favorite pig in Hong Kong, and it was delicious as usual. If I had to be critical, I'd say that the rice was a bit soggier than usual. But that doesn't detract from the flavors and everyone loved it. Even our little birthday girl was chomping on one of the ears with a big smile on her face. We finished with some pea sprouts stir-fried with garlic (蒜茸炒豆苗) as the veggie is still in season.